She is currently Senior Research Fellow at the Ca’ Foscari University of Venice for the DomEqual Project after working at the Migration Policy Centre, European University Institute as a Research Fellow. Her research interests embrace domestic work; gender and migration; immigrants’ children and education; the integration of migrants. 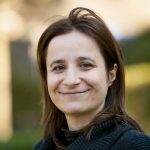 Her recent publications include “Analysis of the Impact of Countries of Origin on Migrant Integration – Success or Failure?” (with Kalantaryan S., Salomonska J., Fargues P., eds. ), Springer International Publishing (2017); “Migrant Women’s Employment in Paid Reproductive Work through the Crisis. the Case of Italy (2007-2012)” (with Marchetti S.), Investigaciones Feministas, Vol.53/7: 53-71, (2016); “The labour market insertion of immigrants into Italy, Spain and the United Kingdom: similarities and differences and the Southern European model of migration” (with Gabrielli G., Strozza S.), in “Migration in the Mediterranean. Socio-Economic Perspectives”, Ambrosetti E., Strangio D., Wihtol de Wenden C. (eds. ), Routledge Studies in the European Economy, London, Routledge: 57-84 (2016).